Indians are increasingly looking out for international school curriculums. More Indians are opting to go abroad each year to pursue higher studies. 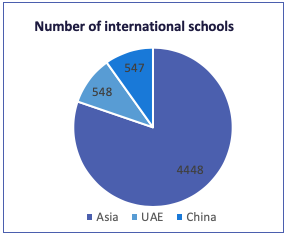 International schools are an increasingly significant sector for higher education international student enrolment. No longer are they simply the domain of expatriate children. Today, over 2.5 Mn local children are going to international schools in India as they are seeking quality education as a means to acquire a place at one of the world’s top universities. International Curriculum: Most international schools follow internationally recognized curriculum and quality standards and as this education is accepted almost everywhere in the world, it smoothens entry into college. International education gives a higher quality of teaching and education to the children. Exposure to global culture:With students and faculties from diverse nationalities, students are exposed to different culture and lifestyles thereby opening their mind to various experiences and life skills. Emphasis on extra-curricular activities:Most international schools pay a great deal of emphasis on extra-curricular & co-curricular activities such as sports, dramatics, talents shows, etc. Higher education tie-ups: Associations with international universities give competitive edge to the students aiming to pursue higher education abroad. Asia has one of the largest number of international schools in the world, given its large expatriate population along with increasing demand from locals. In Asia, India is one of the largest demand drivers for high quality international education, and as a result has some of the best developed private K-12 schools. There are more than 300,000 private schools in India, of which over 95% are low-cost providers, and only about 5% of private schools are affiliated with major education boards in the country. The international school segment has expanded considerably over the past decade, doubling to the point that there are now more than 400 schools in operation. International mobility of students from India is also on the rising. This is facilitated through effective international curriculum in the formative years. The surge in international schools has been and continues to be fuelled by demand for a top foreign university degree. Traditionally populated by children of expats, international high schools are now catering to the teenagers of wealthy locals. Languages are an important part of the international curriculum. Inclusion of foreign languages such as German, Italian, Russian, Portuguese etc. completes the foreign language teaching in schools. plentiful number of international schools mushrooming in the country stands a testimony to the same. International schools are no longer being an option for just elite and expatriate families, and parents’ desire to equip their children with English language skills and prepare them for university overseas have contributed to a worldwide boom.